Very tricky error. The clue is in the name after Error: in the message box. 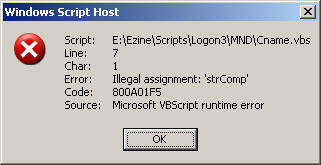 Error code, 800A01F5 occurs when you execute a VBScript. This is a runtime error, check your objects and strings. Your VBScript contain is a misuse of a string or object variable. The clue here is in the ‘strComp’. What could be wrong? In the case of this WSH error the logic is faulty, what is required is an object property, not a str = string property. Paul DeBrino also reports that trying to set a variable which had previously been defined as CONST also results in Error 800A01F5. Incidentally, Source: reports a runtime error not a compilation error, this means you are looking not for a pure syntax problem, but a fault logic error. In the case of runtime errors, you can use this temporary work around. Add this statement just before the line which errors: On Error Resume Next. Check the syntax of your script. In my VBScript example line 7 is the problem. With WSH error messages, Char 1, is often unreliable, the problem could be anywhere on that line. Check your variables, none should also be CONST. The problem is that you cannot set a variable to be equal to this particular property (.Username). As the error messages says, this is an illegal assignment. ‘ Guy Thomas February 2010. ‘ WScript.Echo OurNetwork.Username &" ‘s Network drive mappings:"
Windows Management Instrumentation (WMI) is one of the hidden treasures of Microsoft operating systems. Fortunately, SolarWinds have created the WMI Monitor so that you can examine these gems of performance information for free. Take the guess work out of which WMI counters to use for applications like Microsoft Active Directory, SQL or Exchange Server. For interpreting the WSH messages check Diagnose 800 errors. 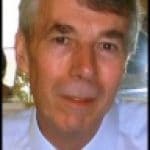 For general advice try my 7 Troubleshooting techniques. See master list of 0800 errors.